c. jane create: i'm back from san diego! i'm back from san diego! It only took me 11 hours from the door of my hotel to the door of my house, but I'm home from BlogHer '11! I arrived on Thursday morning and took a few minutes to unwind from my trip there. Which wasn't hard with this view! Because the hotel made a little mistake with our room assignment, we ended up in a room with a fabulous pool, marina and bay view. Can't complain about that! I enjoyed a $9 hurricane with an umbrella that had been through a hurricane itself! Definitely not worth the nine bucks, but I had a great view of the bay while I had lunch with Jessica. We got all registered and started wandering the expo hall. There were so many people to see! Friday morning after breakfast, I headed to a Knorr cooking class. I already use several of their products and was glad to be able to connect with them in the expo hall. I'll tell you more about my class in a future post! I spent post of my day in the convention center on Friday, either wandering the expo hall chatting or learning in the sessions. I did get a little pool-side time. And I got to meet Lori and have lunch with her! I'm sorry I didn't get to hang out with her more. That happened a lot - everyone is always going somewhere or doing something and it was hard to connect with some people. Saturday morning started with a workout led by Bob Harper from The Biggest Loser! He was so funny and nice. The work out was h.a.r.d. My thighs are still burning. After that we had a breakfast with him where he answered questions. It was obvious that he really cares about people and their well-being. After getting dressed for the day, we headed over to another hotel to shop at the Queen Bee Market! I was so excited that they were in town the same weekend. I'll have more about the market in another post, too. I went to a session and then Lissa and I decided we needed some sun time. We enjoyed the warm sun for a while - I even fell asleep! It was awesome to be outside while not sweating to death. Take note Missouri! Then Jessica, Lissa, Jen, Claire, Alicia and I grabbed a late dinner. I ordered a jumbo lump crab cake, which looks small in that picture. It was about 3.5 inches across! It was SO yummy! Then we all headed to one of the many parties of the weekend. It was hard to make connections at the parties, but they were still fun! The next morning I packed up and headed down to the pool for some brunch. And yes, I had churros as part of my breakfast. I couldn't resist! And then off to the airport... which started my 11 hour journey toward home. And I'm happy to be here. It was a crazy weekend, but I loved every minute of it! I'll be sharing more detailed posts in the coming days. Oh my gosh Christa I am all sorts of jealous! I totally want to do this next year! Wow, that all sounds awesome~! I would love to go too! Wow, that looks like so much fun!! 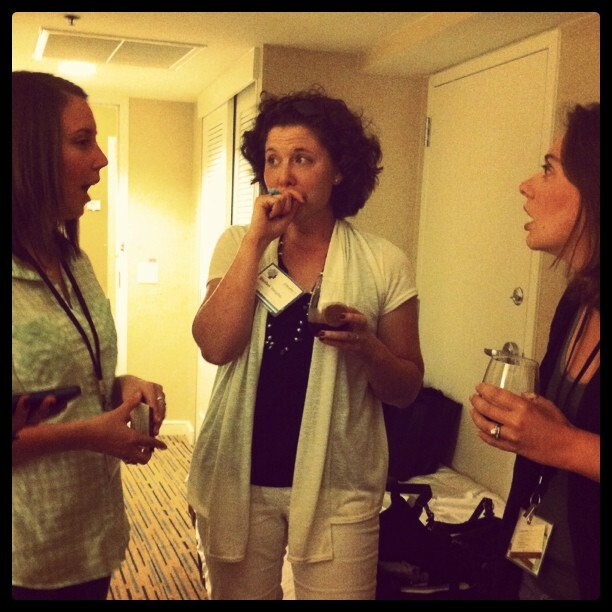 I hope I'll be able to make it to a BlogHer one of these days! A treat to meet you at BlogHer. Cannot wait to make your Lemon Crinkle Cookies! So fun! So glad you were able to attend and have such a great time! What an amazing experience you had! I can't imagine all the thoughts that are swirling around your head about blogging and what not now. Maybe you could share a little bit of what you learned when you have the time. P.S. Bob Harper?! How cool! Amanda - I will definitely share more! I learned about a lot of topics that feed into blogging. And meeting Bob was awesome!